Our commitment is in providing the highest quality eye care, with a personal touch. As optometrists, we are uniquely trained to correct your vision with glasses or contact lenses as well as in the diagnosis, treatment and management of common eye disorders. We are proud to serve our community, including the Palmetto Bay, Pinecrest, Cutler Bay and Kendall areas for more than 30 years. In addition, our staff, with a combined 70 years of experience, will exceed your expectations in knowledge and patient care, as they are an integral part of meeting your eye care needs. We accept most insurance and vision plans, but please contact our office with any questions. 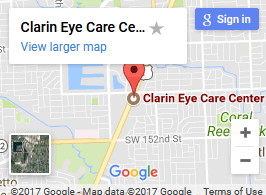 We look forward to having the opportunity to serve your optometric needs and would be delighted to have you join the Clarin Eye Care family.